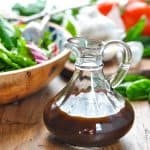 This Italian Balsamic Vinaigrette is a simple homemade salad dressing that's ready to enjoy in just 5 minutes! Whisk (or shake) together all ingredients until completely combined. Make sure that you finely mince, press or grate your garlic. You don't want any big chunks of garlic floating around in your dressing. Prep ahead! You can make a batch of this honey balsamic vinaigrette and keep it in your refrigerator for at least 1 week.